My children have always been curious when I cook in the kitchen and have been begging to “help” for awhile. I have been reluctant but after viewing Kid’s Kitchen by Barefoot Books, I decided it was time to let my little chefs create their own fun and nutritious meal offerings. The recipes are very easy to follow and include step by step instructions that guide you and your child through the entire process. After careful consideration (they literally spent over 45 minutes looking through the recipe cards) they selected “Pizza Party” as the first recipe to make for dinner that evening. I like that this recipe allows my children to try a food that they really like and add a healthy & nutritious twist to it by using quality ingredients like fresh vegetables, raw cheese, olive oil and pesto sauce. Since they are still so young (3, 4 and 5), I was in charge of all the cutting and oven baking. They were fully in charge of gathering together all of the ingredients, shredding the cheese, mixing the flour to make the dough, rolling out the dough etc. We had a lot of fun and the end pizza was delicious and satisfying. Kid’s Kitchen is also a fun way to get children to try new and exotic foods. I find that when my children help or make the recipe themselves they are much more willing to try and enjoy something new. From this book we have tried the “Cool Berry Smoothie”, “Delicious Dahl”, “Breakfast Friends” and “Easy-peasy Pancakes”. My favorite was the Delicious Dahl and the kids really liked “Breakfast Friends”. Which recipe would be your child’s favorite? 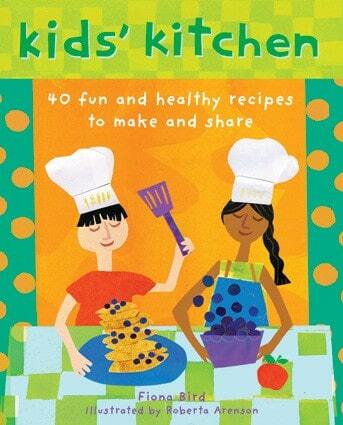 You can purchase Kid’s Kitchen from Barefoot Books for only $19.99. Follow blog on Google Friend Connect. Sign up for the Barefoot Books email list. Follow Barefoot Books on Twitter. My daughter would love the winter shadow book! I follow on the blog frog! I voted for Simply Stacie on Picket Fence Blogs 2/5. I voted for Simply Stacie on Picket Fence Blogs 2/6. Tales of Wisdom and Wonder is my favorite.